Something very fresh and vibrant hit the Northern Quarter in Manchester last night in the form of Holy Matrimony. Nigel Carr caught up with the band for Louder Than War with photos by Jack Walsh. 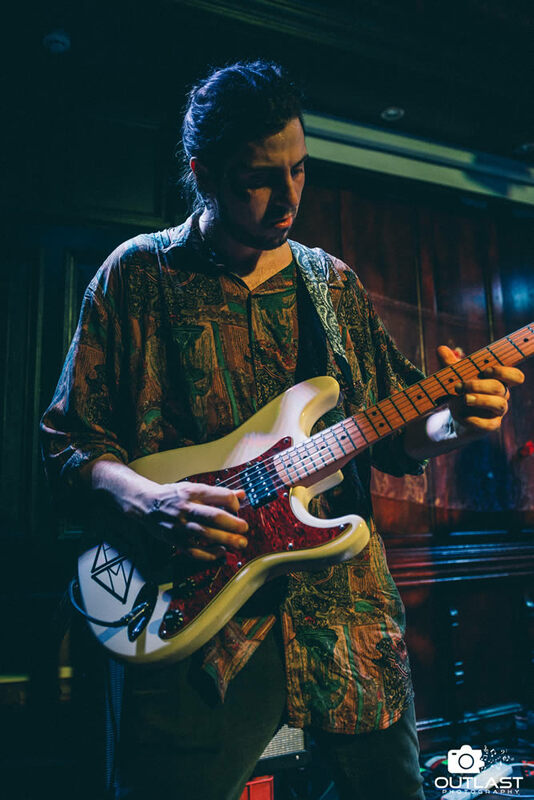 The three piece from Merseyside currently working out of our fair city is fronted by flamboyant multi-instrumentalist and singer Roger Damen. The band played a stunning set of beautifully constructed soar-away electro-pop, overlaid by the front man’s amazingly deep and luscious vocals. Whilst other bands are following the post-punk route of Cabbage and their contemporaries, performing bare chested with slogans scrawled on their chests. 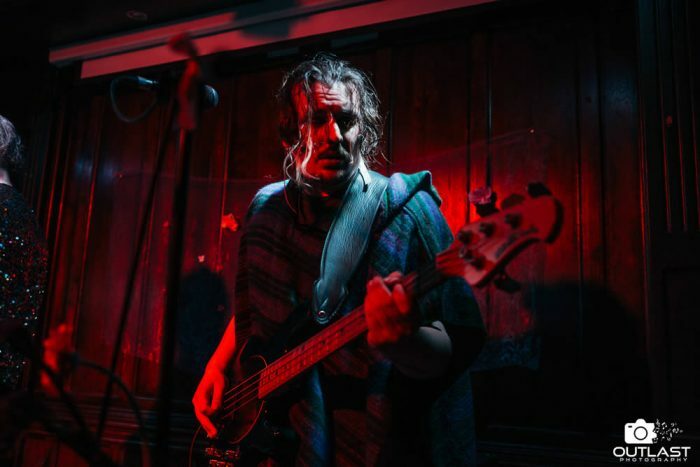 Holy Matrimony’s immersive sound is based purely around the quality of the song writing and the enthralling delivery. There is no sneering punk attitude here, however sincere. It’s unashamed entertainment, performed in a charming, genuine and charismatic way. Brilliantly played and perfectly executed. Think, Ultravox meets Chvrches with a balladeer leader! The sold out event took place at the gritty Castle Hotel on Oldham Street and was organised to launch the bands new EP, Dearly Beloved Part One. “Oh yes there will be a Part Two” the singer told us at the start. Opening with Finer Things, the third track on the new release, the band demonstrated their awesome song writing ability from the off. 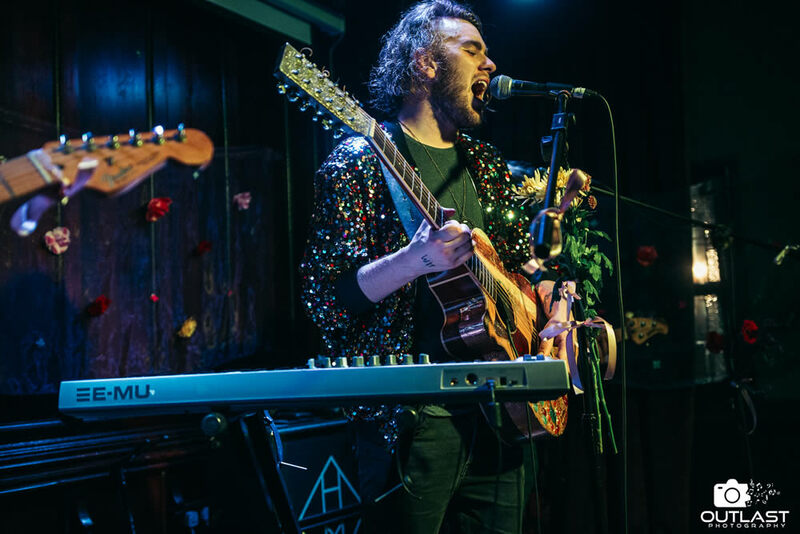 Damen took centre stage strumming his gold acoustic whilst punctuating the tracks with keyboards to a pounding electro-drum-machine backing. Hair flailing he was very much the entertainer, smiling and talking to the audience between tracks. Jonny Adams highlighted on electric guitar and Jack Ellis underpinned the tracks with a dark rumbling bass. It was extremely hot at the back of the venue and I’m pretty sure that Ellis regretted his choice of knitted poncho! 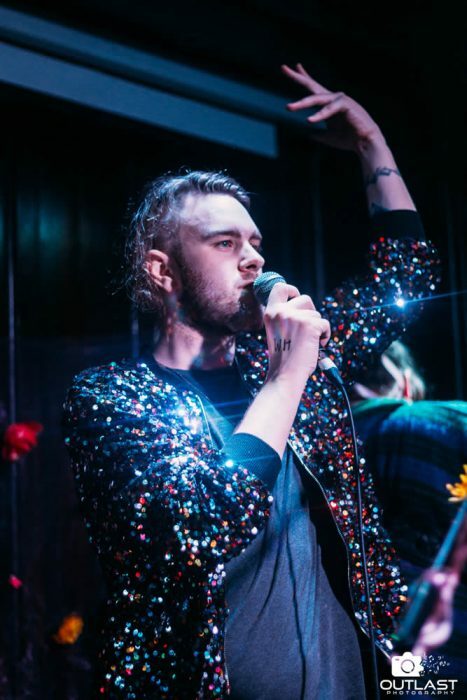 Damen in glitter jacket sparkled from the small stage, the band’s faces adorned with glitter face paint that was also available on the merch. table! The sound alternated between ballad and anthem, including tracks that appeared on their first private release almost a year ago. The swirling punch of In A Dream Of You And I being a particular highlight. They closed with the two leading tracks off the new EP, the epic If You Cannot Love Yourself and title track Dearly Beloved. Both of these new tracks rocked with complicated verse structures and infectious hooks. The band have been on a short tour of the North West before starting work on their next release. Expect to hear a lot more from them in the near future. Best of all go and see them, then pick up a copy of the new EP at the venue or from the site below! Holy Matrimony Can be found on Facebook and Twitter.